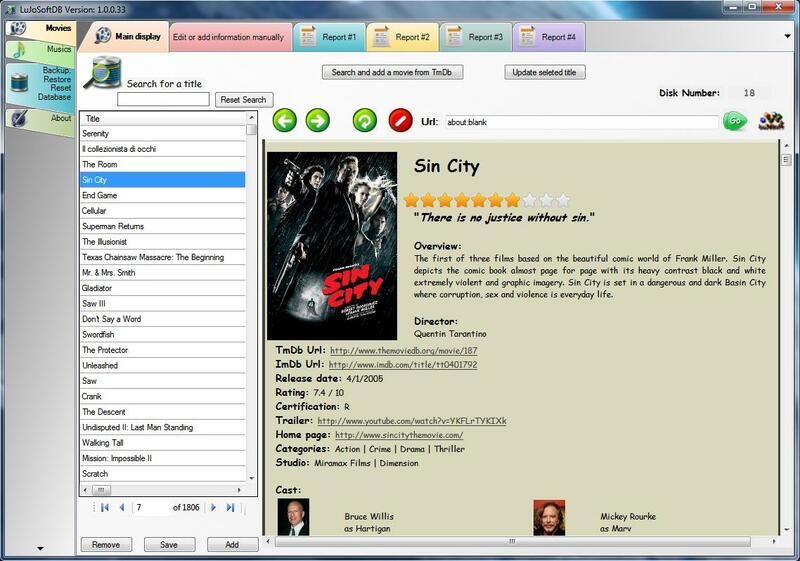 LuJoSoftDb is fully integrated with TmDb, themoviedb.org online database.When you add a movie to your collection you will be able to search TmDb for information and images which will be downloaded from the net and filled in automatically. To view one of the movie in your collection, just click any title to display all the info on the movie in a webpage style.Auto-update function that checks for new updates every week plus an update now button. * Contain a small and functional web browser to view your collection and to browse the web. * You can add and edit title manually. * Four different report feature to print you collection, or save to Pdf, Excel and word format. * Include a live search for your movie collection and get all the info needed in second. * Many diferent sorting options. * Backup, restore and reset function for the database. * Auto-update function that checks for new updates every week plus an update now button. * Absolutely free!!! No catch, no nag screen, no cripple function. 1. To add a title press the "Search and add a movie from TmDb" button. 2. Then enter the title name and click the "Search" button. 4. You are done all info is entered in your database. NetworkGazer- Security network monitoring systems with documenting capabilities. Watch Live TV broadcasts on the Internet! Qweas is providing links to LuJoSoftDb 2010 as a courtesy, and makes no representations regarding LuJoSoftDb or any other applications or any information related thereto. Any questions, complaints or claims regarding this application LuJoSoftDb 2010 must be directed to the appropriate software vendor. You may click the publisher link of LuJoSoftDb on the top of this page to get more details about the vendor.